Fig. 4-1-4-2 shows the percent distribution of foreign national juveniles detained in juvenile classification homes by nationality, etc. in 2011. The Philippines was the highest in proportion, followed by Brazil, South/North Korea, and China in that order. Fig. 4-1-4-3 shows the number of foreign national juveniles newly admitted to juvenile training schools over the last 10 years. The number gradually decreased from 2006 through to 2010, but then significantly decreased in 2011 (down 35.8% from the previous year). Available treatment courses (See (1) c. of Subsection 2, Section 4, Chapter 2, Part 3) at juvenile training schools include the living guidance course G2, which was established in 1993 to cope with the increasing number of foreign national juvenile inmates. Foreign national juveniles that require different treatment from that of Japanese juveniles are categorized into the living guidance course G2 and provided with guidance on Japanese-language acquisition and the basic living style in Japan after consideration of whether they will remain in Japan or not after being discharged. The number of foreign national juvenile probationers (excluding those placed under short-term probation for traffic offenses) and juvenile training school parolees newly placed under probation/parole supervision in 2011 was 338 (252 juveniles probationers and 86 juvenile training school parolees)(down 14.4% from the previous year). By nationality, etc., the largest number were from Brazil at 87, followed by South/North Korea at 79, the Philippines at 49, China at 48, and Peru at 26 (See Appendix 4-6 for details). 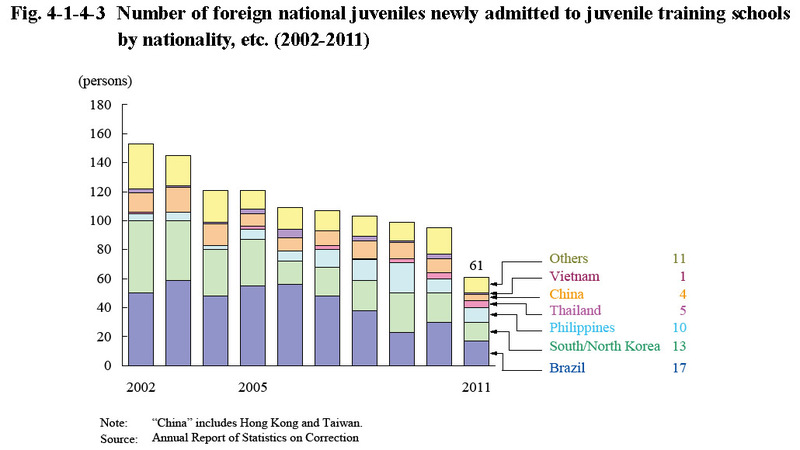 As of the end of 2011 the number of foreign national juveniles (excluding permanent residents and special permanent residents) placed under probation/parole supervision was 123 juvenile probationers and 43 juvenile training school parolees (Source: The Rehabilitation Bureau, Ministry of Justice).